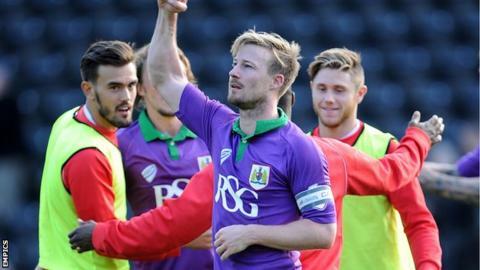 Captain Wade Elliott said he "dodged a bullet" after scoring the winner for Bristol City - 30 seconds after gifting MK Dons an equaliser. With City leading 2-1, the midfielder poked a backpass to goalkeeper Frank Fielding, which was intercepted and finished off by Benik Afobe. But Elliott made up for his mistake by running through the Dons defence to score and give his side a 3-2 victory. "It was a crazy minute," the 35-year-old told BBC Radio Bristol. "I'm there moaning at the lads all afternoon and I'm the one who makes a big error and had to carry the weight of letting us down. "It was a horrible mistake but I was fortunate enough to get out of jail a minute later. It was a mixture of emotions and I was pleased to dodge a bullet." Joined on loan from Birmingham in January. Scored three goals in 19 games. Signed a permanent deal at Ashton Gate in the summer. Made captain following Sam Baldock's move to Brighton. Scored in the opening day victory over Sheffield United in August, and netted winner against MK Dons on Saturday. Unbeaten Bristol City went into the game top of League One, five points clear of the Dons in the second. Steve Cotterill's side found themselves 2-0 up at half-time through two Kieran Agard goals but Dean Bowditch pulled one back for the visitors before Elliott's mistake led to Afobe's tap-in. "You can't explain why you choose to toe-poke it instead of putting your foot through it," said Elliott. "My mind was racing and you think 'please get there, save it Frank, please bobble away somewhere else'. But it goes in and your mind is a bit of a blur. Your head is everywhere. "I remember then looking at the clock, seeing 20 minutes to go, and thinking I might get the chance to make it right. You just don't expect it to come 30 seconds later." Elliott then managed to weave his way through on goal and his strike proved to be the winner, and City stretched their unbeaten league run to 16 games. "I hadn't really thought about anything up until then," he continued. "I was running on instinct. "It was a lovely feeling when I saw it go in. I was a mixture of joy and relief."